Stand Up cycling combines the best of running, cycling and the elliptical trainer to give you a fun and effective way to exercise outdoors. Because it is a low-impact exercise, Stand Up cycling builds cardiovascular fitness, while being easy on the joints, which makes it great for everyone – young or old, health conscious to elite. Stand Up cycling is a great way to revolutionize your fitness. Fun To RideThe speed, handling and motion feels like “running on air,” giving you a carefree exercise experience at any age. ComfortableThe natural “stand up” riding position reduces stress on your neck and back while completely eliminating seat pain. Great Full-Body WorkoutThe stand-up position of elliptical bikes engages your core and upper body in addition to your legs. Heart HealthyBurns 33% more calories than a traditional bicycle, providing a better workout in less time. OutsideMeant to ride outdoors on the same paths that you walk, jog, run or bike, but compatible with indoor stationary trainers (3C/8C/11R only), so you can train year round. Current, former and injured runners all use ElliptiGO Stand Up bikes to experience the joy of running, but without the negative effects of impact. Athletes of all ages and abilities use stand up cycling to stay healthy, avoid injuries and improve endurance. Outdoor enthusiasts and fitness fanatics alike use stand up cycling to get all the benefits of an elliptical workout, but without being stuck indoors. Whether it is to improve health, lose weight or increase fitness, ElliptiGO bikes can get the job done. Both recreational and competitive cyclists benefit from the gentle joint angles and 33% higher caloric burn of ElliptiGO bikes, making them perfect for any rider looking for a more comfortable, time efficient or effective workout than a traditional bike provides. How Does Stand Up Cycling Compare? A Stand Up bike is an excellent form of exercise, and it compares favorably to activities such as running, cycling and elliptical trainers. Let’s take a closer look at other forms of exercise. How easy is it to balance? ElliptiGO Stand Up bikes require about the same amount of balance as traditional bicycles. Watch a video of customers talking about what it’s like to ride a Stand Up bike. 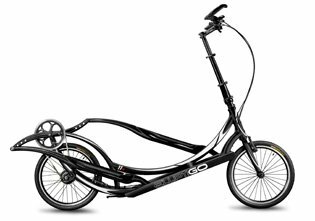 Can I use my ElliptiGO bike indoors on a stationary trainer? Yes. 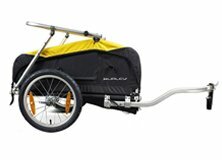 The 3C, 8C, 8S and 11R models work with several different stationary bicycle trainers that can accommodate a 20” wheel size. We recommend the Kinetic Rock and Roll Trainer and Kinetic Road Machine. Both of these trainers require a small wheel adapter for use with 20″ rear wheels. This is included when you purchase the trainer through our Store. You can find more details on each of these trainers in the Stationary Trainer section of our online store. Can stand up bikes climb hills? Indeed they can! Think about how a rider on a traditional bike climbs a big hill – he or she gets out of the saddle and stands up. Our bikes are made for that! The long drive arms, elongated pedaling path and wide gear range of ElliptiGO 8- and 11-speed models make them especially strong climbers. ElliptiGO cyclists have climbed such famed mountains as Alpe d’Huez (often featured in the Tour de France) and Pikes Peak.